Wine! Jamón! Artisan Beers! Cheese! Cazalla! 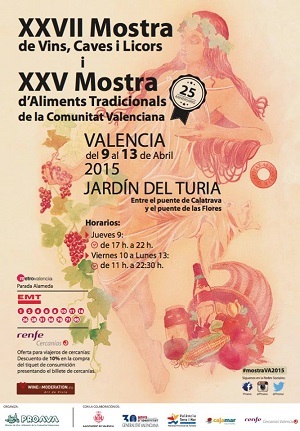 The Big Five – Ready and waiting for you in the Turia river bed from Thursday 31st March to Monday 4th April 2016 at the XXVIII Mostra de Vins, Caves i Licors in conjunction with the XXVI Mostra d’Aliments Tradicionals de la Comunitat Valenciana. Bit of a mouthful? In layman’s terms that means a WINE FAIR and a FOOD FAIR. Together, side by side, living in alcohol-fuelled hungry harmony. The clientele of the Mostra de Vins is a bizarre mix of businessmen contemplating the latest bobal, groups of pensioners enjoying an all-out banquet having brought their own plates and cutlery and youths getting boisterously pissed in the corner. The corner where the Anis Tenis tent is, that is – and let me tell you why. Free shots. That’s it. Ask the staff nicely and they give you a free shot of cazalla (aniseed flavoured fire water) or limoncello (a luminous, sweet lemon liqueur), and- get this- stickers. 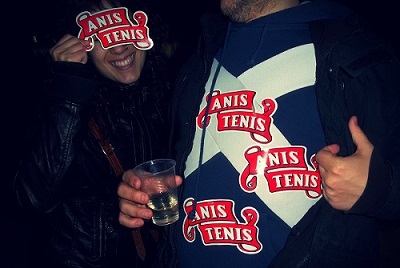 Just don’t, under any circumstance, let it become a competition amongst you and your friends to see who can stick the most Anis Tenis stickers on themself. That would be bad. All jokes aside, the Mostra de Vins is a must for all wine, beer and embutido aficionados. Sample the vast array of red, white and rosé wines, mistela, cavas, locally brewed beers, and more, for around €2 a drink. Bulk tickets, on sale for €10, allow you 4 food samples and 4 drink samples with a wine glass and a tapas dish included. What could go wrong? The Mostra de Vins is located in the river between the Calatrava bridge and the Flower bridge. Get here with the metro (L3 + L5) alighting at Alameda. Alternatively, various buses pass by Paseo Alameda including the 19 and 40.